I guess if you are not trying to fill up, eating rice is sort of antithetical being it's a bulk kind of thing in your stomach. 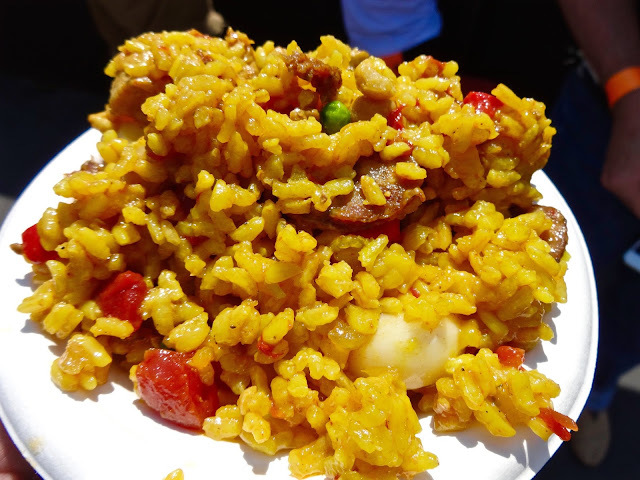 Still, we decided to try Gerard's Paella, as I'm always down for a good one. Sadly, this chicken and sausage concoction wasn't one of them. Rice was way too sticky and even with chunks of garlic in here, it was surprisingly devoid of flavor, spice or kick of any kind. At least it saved us some room. After a few bites we tossed it in the compost and moved on. I had walked by Pinx Catering's booth previously and found my way back to get a sweet treat. The sweet potato pie waffle with bourbon sauce, candied bacon, whipped cream and vanilla ice cream. (I'm not much of an ice cream person thus I got it on the side for the SO to enjoy.) On this dish I'm torn. I really wanted to like it more than I did. The waffle was stuffed with sweet potato but still came off just a tad dry. While I think the ice cream would have helped, I was hoping the waffle would stand on its own. Maybe some more of the bourbon sauce (or butter!) would have good too. 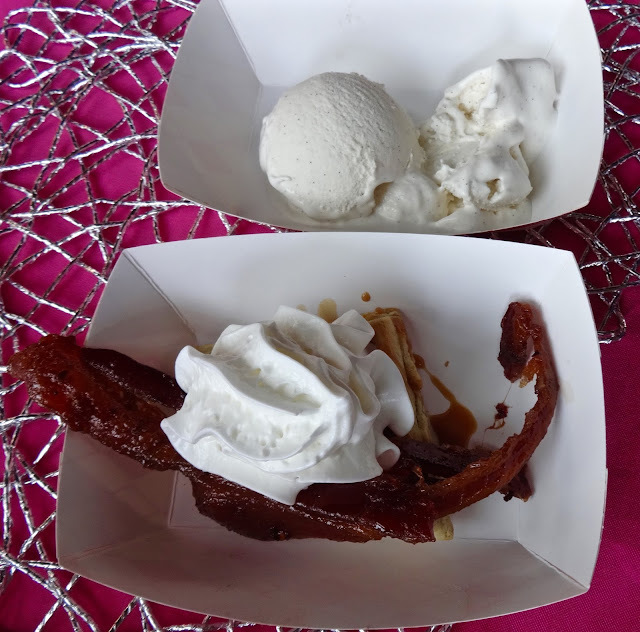 While this candied bacon was a bit on the sticky side, I'm still a sucker for salty sweet and it was good enough. Overall, I'll give this dish a pass as tryable if you come across it. Though, best to get the ice cream on top and ask for extra sauce. 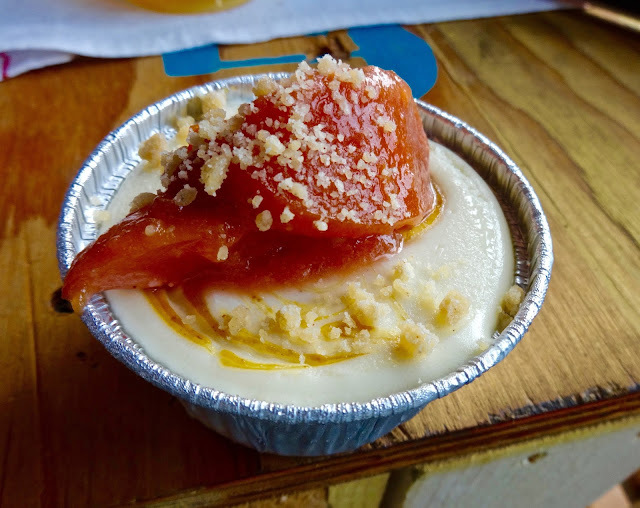 Staying on the sweet train, I couldn't pass up Crumble and Whisk's roasted peach crumble cheesecake. This was a tasty little treat. The peaches were only on top and I couldn't really taste any roasting on them plus they were a little on the still crisp side, maybe some more cooking to soften them up. The cheesecake was nice and creamy with just a light touch of lemon in there. It was sweet without being too sweet. It also had a lovely little graham cracker crust on the bottom. Chilled this was a nice little refresher from the heat. One place I was looking forward to trying was Sugarfoot Kitchen. I'd seen them around for awhile but hadn't had the opportunity till now. 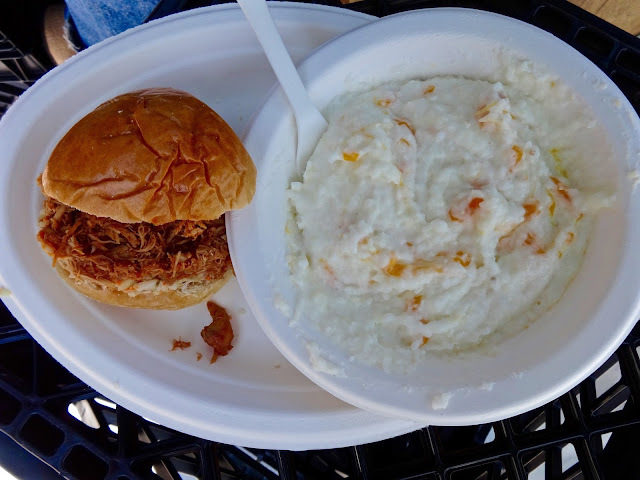 I ordered up their barbecue pulled chicken slider with slaw and a side of cheese grits. As a North Carolinian into barbecue (maybe it was the heat! ), I ordered thinking this was pulled pork, not chicken. Had I realized, I'd probably have passed as the meat was a little too wet and sweet for my taste. I will say, I did like the slaw on here. It was a finely chopped mesh of carrots and cabbage with a dash of vinegar of which I'm a big fan. The grits, while cooked well, were just okay. I think I was just missing some butter and pepper, my preferred topping for grits. Creamy, yes, beyond the shredded cheese, they didn't have much flavor. There were hot sauces on offering you could use to spice things up but as far as grits are concerned, that's a little to California for me. 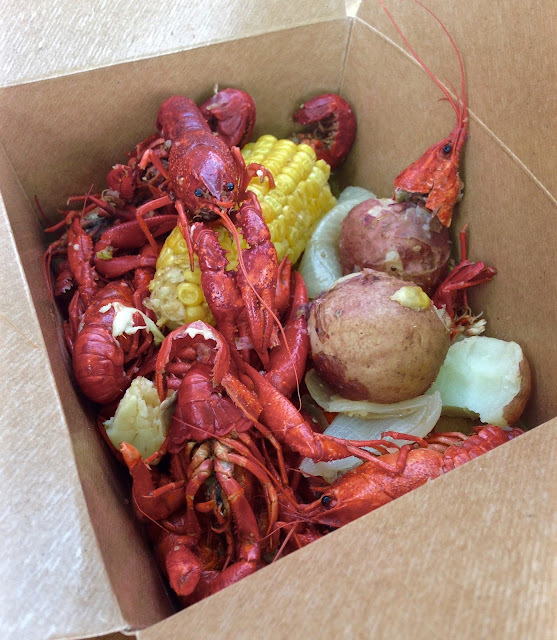 At the seafood counter inside the big warehouse, the SO sidled up and ordered the crawfish boil from Boxing Room. Yes, these were perfectly cooked and a very tasty dish, But it also reminded me why I don't usually do crawfish. Besides being hard to shell, ugh, I just can't get into the whole sucking the head thing. Plus, these are not like eating shrimp, crawfish are bottom dwellers that feed on detris on the river floor, the meat is kind of grayish and the smell is kind of unappealing. But that really is more of a personal taste feeling I have about these critters. While these would not have been my first choice, for what they are, Boxing Room does a spot on version of this popular low country dish. This particular plate was the SO's pick from Aedan. It was a Japanese bento box featuring items using their various fermenting spices and techniques. There's some mushroom thing in the upper right. A sweet paste roll up thing. Edamame. 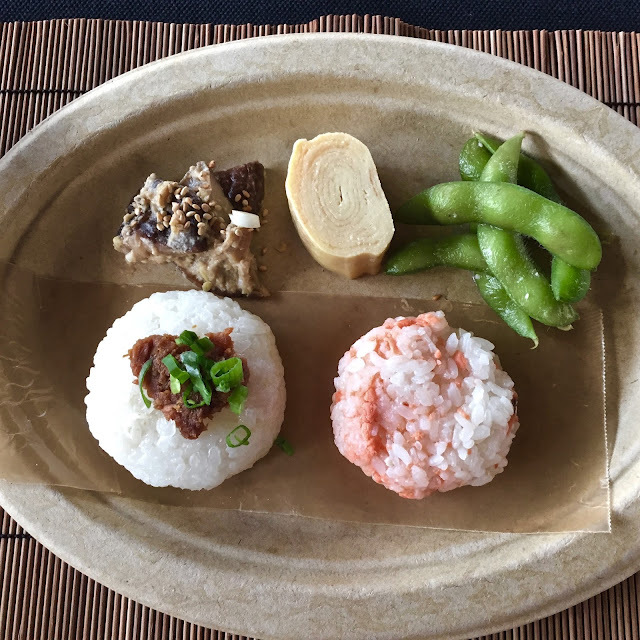 A fermented something on a rice ball and a salmon rice ball. I'll stand right up and say, outside of the edamame, this stuff is so not my taste. Thus I'll leave it up to the SO who said it was all really tasty and very traditional flavors from Japan. That works for me, hopefully it works for you too. While I'd been to Three Babes Bakeshop before, I felt a hankering for a hunkering of pie and made my way over to their booth to see what they got. I didn't want anything too sweet (shocking yes!) 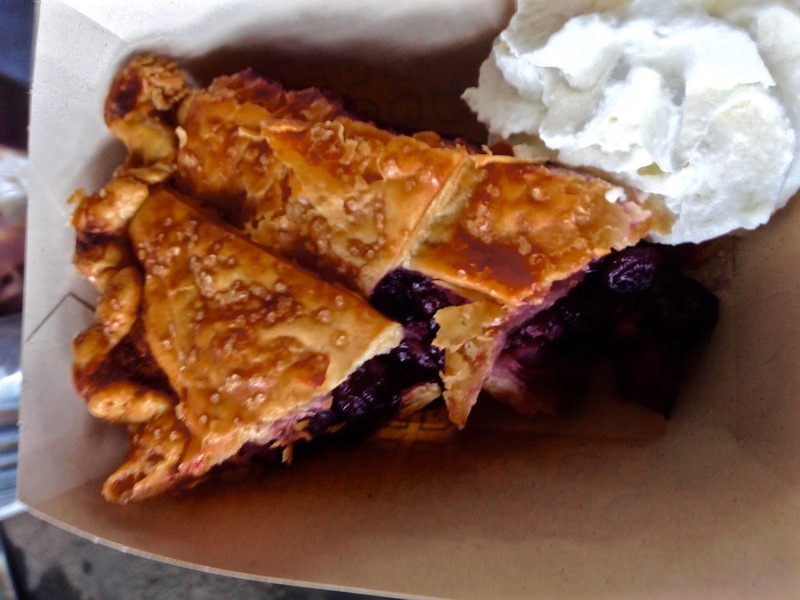 and found my eyes gravitating to the blueberry and ordered it up. I have to say, the blueberries tasted kind of weird, like they weren't real blueberries, but something flavored like a blueberry. Yeah, can't explain it and the SO couldn't either. It wasn't like any traditional blueberry pie I'd had before. I didn't mind that it wasn't so sweet, it just somehow seemed off. I'm still a fan of their crust--buttery, flaky--that still worked for me. I munched that off and tossed the rest of the filling. Into our fourth hour here, I found myself drawn to Mister Jiu's. 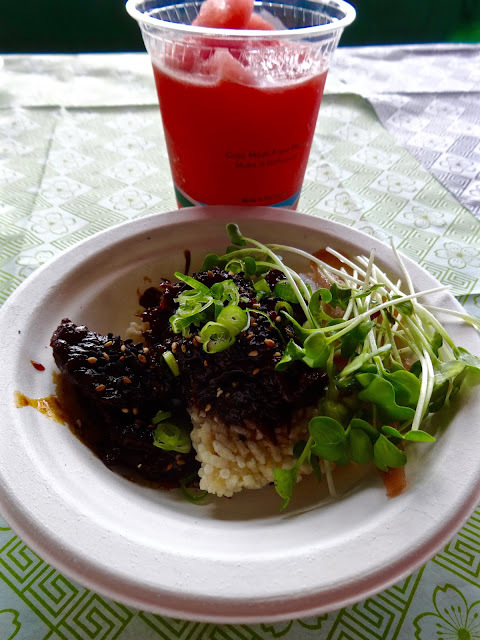 They were serving up braised beef cheeks and tails with a rice cake, daikon sprouts and pickled ginger. An interesting mix of textures here. The meat was a little sticky and veered somewhere between to (soy sauce) salty and overly (oyster sauce) sweet. At least it was tender. The sprouts didn't really do much for me, nor did the pickled ginger. I guess I was expecting something else, like chunks of meat in a gravy kind of thing. Plus the rice cake was kind of hard. Eh, not terrible, but not something we'd probably get again. Their other item was probably one of the bigger hits of the festival--watermelon ice! Chunks of water melon ground up with ice, a dash of salt, a spoonful of what I'm gonna say was something akin to sorghum. A kind of powdered sweetner. She wouldn't say exactly what it was, but I'd say it's close. Didn't matter. On a hot day like this, it was refreshing and yummy. So much so, me and the SO each got another glass for our long MUNI ride home. Cool, refreshing, delicious. There they are, the rest of the 8 dishes we had. Though, technically, if you break them all down into separates, it's another 10 dishes. But once you reach this level of food consumption, does it really matter? As usual, it was a mishmash of good and bad and that's to be expected, not everyone is going to like everything you do and so what. The fun part of doing all this is getting to try so many different things in one setting. Not to mention getting to people watch such a large cross section of folks from San Francisco and the Bay Area. 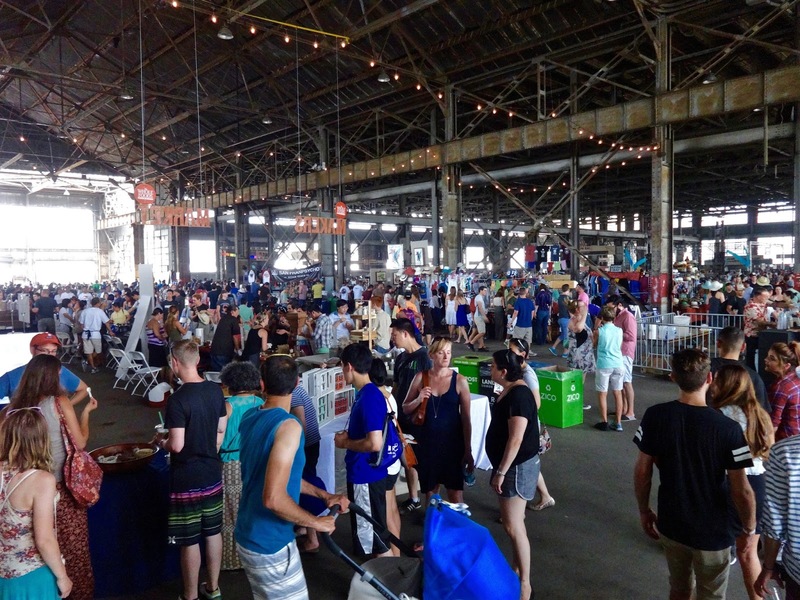 All in all, it was a fun (really hot) time at the Festival and when this rolls around again next year, I highly recommend buying tickets and making your way out to Dogpatch. While it may not be as hot next year (global warming or el nino--who knows), the one thing you need to bring is your appetite to try as much different food as your stomach will allow. And possibly some tupperware to bring home leftovers--no judgement here.